Cost to manage illiquid portfolio assets too high to justify, according to Hossein Kazemi. Hossein Kazemi, senior advisor to the Chartered Alternative Investment Analyst (CAIA) Association and professor of finance at the Isenberg School of Management at the University of Massachusetts, Amherst, is making a surprising claim for an alts guy. Kazemi says small endowments should skip hedge funds, private equity, and other illiquid assets in favor of a multi-asset ETF portfolio. 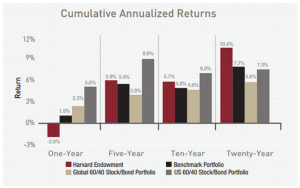 According to Kazemi, while many endowments have opted to copy either the Harvard or Yale Endowment portfolio mix by including alternative investments, few of them have the same access to top-tier managers that those endowments do, leading to pretty pricey underperformance. When looking at the data, Kazemi says that although there has been a significant effort to add alternative strategies, those allocations haven’t added much diversity; portfolios are still heavily invested in US equities. The only difference is the fees paid for that exposure. He adds that the allocations within endowment portfolios don’t change much over time, which means that the price for underperformance can actually compound year-over-year if investment teams aren’t consistently re-evaluating how the portfolio is constructed. “Entering and exiting illiquid positions is difficult. Even if endowments are proactive about portfolio management, allocating to illiquid assets can mean foregoing other market opportunities,” Kazemi contends. In a recent article on his claim, Kazemi showed that even with access to top-tier managers, Harvard hasn’t been able to beat a basic 60/40 portfolio construction over a one-, five, or 10-year time horizon. He says that this performance drag is similar for smaller and medium-sized endowments that are copying Harvard’s model. “Overall endowment portfolios are highly correlated to each other; no one wants to get caught out doing something different and being wrong about it,” Kazemi says. So what should small and medium sized endowments do? Kazemi posits that a portfolio made up of the following ETF mix would provide a consistent return and lower overall costs to endowments.